Huge 2 seater ride on fire engine truck with twin motors, lights, working fire hose, real 4 wheel drive, and cool sounds too measures almost 5 feet long! This 2 seater ride on fire truck can fit 2 children or a child and a pet. Reach speeds up to 5 mph with the 3 speed gear box that has reverse too. Great for ages 18 months to 12 years old and over plus this fire truck comes with a powerful 12 volt rechargeable battery, adjustable real leather seat for 2 children, real working doors, PA loudspeaker, working fire tank/hose, and 4 motors making this true fun for kids Works on grass, street, dirt, and gravel. Do not be fooled by lower price models with less power, no features, or options. 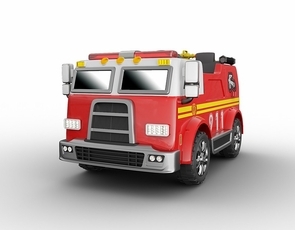 Start patrolling your house and neighborhood in style with this great ride on fire truck. Comes with a working fire gun hose and PA loudspeaker system too. Yes, your child can really ride inside this fire engine truck. Magic Cars® are the best ride on cars. It's like owning 2 cars in 1 as you can allow children to drive the electric car themselves from inside the car with the steering wheel, pedals, and buttons. Or control your new ride on fire truck via the included wireless Magic Cars® steering wheel to operate in Mom/Dad mode. Yes, the light bar really works and your little one can press the buttons to work the horn and siren! Want more? Holds up to 150 pounds, measures almost 2.5 feet, and is a high quality ride on that will last for years. Drive forwards, backwards, left, and right. Don't delay, order today and give that young fire chief the toy fire truck they deserve.